We live in a truly enlightened age. The internet has information on everything from theological treatises to practical costume tips. One day, I got curious about how silk was made. Twenty minutes later I knew how to order my own silkworms, feed them, harvest them, and make silk. I also knew it was far cheaper and far, far, less messy to just order it in fabric form. It even came in colors I liked. Our society uses this incredible tool to watch celebrities, check fantasy stats, and read clickbait. You Won’t Believe These Uses for Whipping Cream! Intellectual curiosity has ebbed. One of the ways this manifests is our obsession with credentials and certifications. Rather than demonstrate a skill, people ‘study’ the skill and receive a piece of paper explaining to everyone how well they can perform the task. On one hand, this makes it easy to search for qualified applicants by any combination of criteria you can imagine. This plays well with our progressive leaders. On the other hand, it makes it much more difficult to find someone good at the task they need to perform. This phenomenon manifests in the oddest activities. 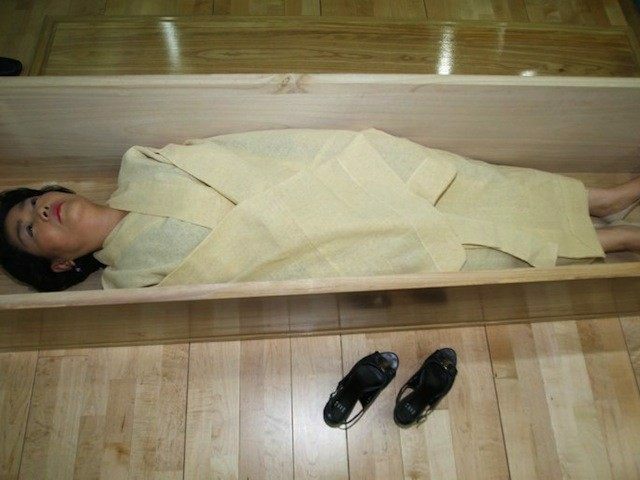 Today’s sample madness comes from South Korea, who admonishes us to attend ‘Death Experience’ Schools before committing suicide. It turns out you should take this activity seriously and become certified. We’ve been doing it all wrong. This makes sense. It is, after all, your final act before stomping out your carbon footprint. You want to make a big impact. Jumping off a higher floor won’t do that. You’d know that if you attended classes. This woman is learning how to leave a good-looking corpse. Note how neatly her shoes are laid out so they won’t trouble anyone who finds her body. I don’t think I would have remembered to do that; I rarely stow my shoes properly. Classes cover everything from writing a proper farewell to aiming for a politician on the way down. Students don’t sit at desks but luxuriate in hand-crafted poplar coffins made in Chinese sweatshops by imported Vietnamese migrants. I imagine, anyway. I didn’t attend the classes; I’m an adherent of the ‘why practice something you can only screw up once’ school of thought. Thank you Great Uncle Gilbert. 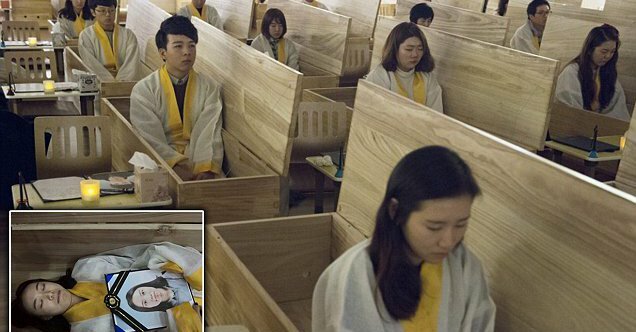 Students prepare for the actual moment of death by laying down in their coffins and waiting for the ‘Korean angel of death’ to seal them in. Sort of like Linus waiting for the Great Pumpkin, but deathly serious. I didn’t think offing yourself would be hard enough to require certification. Just waiting around killing time will do it (In Soviet Union time kills you!) It is the modern age, however: microwave ovens tell us so. Surely one of those would do the trick. If Mythbusters taught us anything it’s that microwaves are deadly. If you don’t mind waiting a little longer, cook and eat a hot pocket. Those things will kill you for sure. California recently passed their suicide assistance law. The powers-that-be will be implementing this in other states. They’ll probably offer these classes. You’d be a fool to pass up a free certification course. You might lose out to another job applicant who completed the training. I can see the executive arguing this: suicide certification is an absolute requirement to work here! With the 2016 elections looming large and Obamacare on the rise, classes like these are becoming mandatory. You only get to use the Earth Exit Door once. Use it well, or die trying. Yep, the original article explains why it is such a problem in South Korea. I can’t look. There are limits.